For those of you who don’t know, probably everyone, I am a professional Chainsaw Carver. So what does that have to do with Game Influence? Well, I’ve have had hopes to make a “special carving” for sometime. Well, in the winter I’m usually low on orders, so I though it’s time to put the project into gear, and get started. So what type of things have I made? I’ve made bears frogs, birds, Tiki gods, squirrels, roses, hearts, and even a Donkey Kong. Below is a picture of a James Bond I did last spring; it took 30+ hours. So what’s this project? I’m going to carve a life size carving of Link, of The Legend Of Zelda franchise. 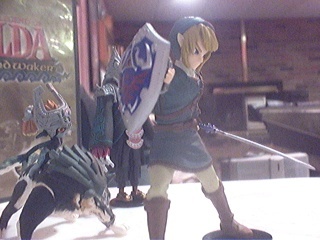 First off, I had to pick the pose and version of Link that I wanted. I considered basing the carving on different pictures found on the internet. Instead of just using a picture, I decided that I should just buy a figurine. 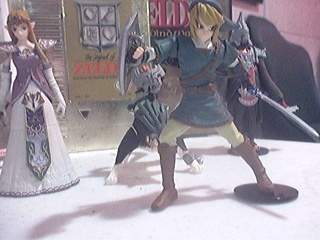 I got a The Legend Of Zelda: Twilight Princess figurine set at a store called Game Quest; pretty cool figurines I might add. 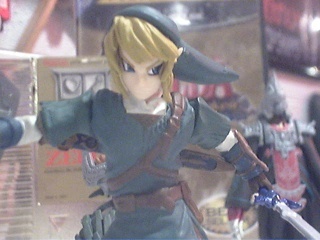 I’m going to use the Link figurine as the basis for the piece. The day after I picked up the figurines, I picked the log that I will make the piece out of, it’s pretty big, at least six feet tall, but it will most likely be slimmed down slightly. I’m doing the carving to my own satisfaction so the time and effort restrictions that are usually the case in creating my pieces are not going to be factored into the project. I might spend as much as 100 hours on this piece(or even more), more than I have spent on any other carving to date. This might just be my magnum opus, and I know fans of The Legend of Zelda franchise wont be upset. I may be selling this carving, so if you’re interested in it, keep a look out on Game Influence. For a more frequent and updated status of the project, check the Link or Mario Carving? post on the Insane Entertainment Forum. This entry was posted on Thursday, December 20th, 2007 at 7:11 pm and is filed under Nintendo. You can follow any responses to this entry through the RSS 2.0 feed. You can leave a response, or trackback from your own site. I like this blog very much, Its a real nice office to read and obtain information. “Never hold discussions with the monkey when the organ grinder is in the room.” by Sir Winston Churchill. Can I simply say what a relief to search out somebody who truly is aware of what theyre speaking about on the internet. You positively know the way to carry a difficulty to mild and make it important. More people have to read this and perceive this side of the story. I cant imagine youre no more widespread because you undoubtedly have the gift. I’ve observed that in the world nowadays, video games include the latest craze with kids of all ages. There are occassions when it may be extremely hard to drag the kids away from the video games. If you want the very best of both worlds, there are many educational video games for kids. Thanks for your post. Excellent post. I was checking constantly this blog and I’m impressed! Very useful info specifically the last part :) I care for such info much. I was looking for this certain information for a long time. Thank you and best of luck. I just couldn’t leave your website before suggesting that I extremely loved the standard info a person provide for your guests? Is going to be back ceaselessly in order to inspect new posts. I like the helpful information you provide in your articles. I’ll bookmark your blog and check again here frequently. I’m quite sure I’ll learn plenty of new stuff right here! Good luck for the next!